If you're in the market for an ultimate-warmth base camp pad, take a good look at Exped's SIM Comfort 10 DLX—and its impressively-high R9.5 insulation value. Exped's SIM Comfort pads come in three flavors: the 5 DLX, the 7 DLX, and the 10 DLX (the numbers correspond roughly to insulation). As the name implies, these are comfort-oriented pads, and even the lightest, the Comfort 5, weighs a solid 45 ounces. That said, at 67.5 ounces (measured), the Comfort 10 weighs considerably less than its closet competitor, the Thermarest DreamTime pad. Like the DreamTime, the Expect Comfort pads are inflatables. Also similar to the Dreamtime, all Exped Comfort pads come with Velcro strips that allow you to easily pair two pads to make a single double bed. There are, however, some distinct differences between the DreamTime and the Exped Comfort 10, so let's take a moment to compare and contrast. Of the two pads, there is no question that the Exped Comfort is easier to deflate, and it rolls into a much more compact package. 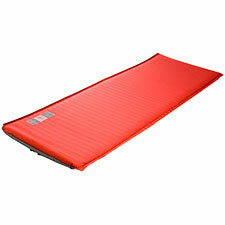 If you intend to travel with your pad, this gives the Exped SIM Comfort an obvious advantage. I also much prefer the Exped's unobtrusive Velcro to the DreamTime's dangling straps. Warmth looks to be essentially identical: R9.0 for the DreamTime, and R9.5 for the Exped. Note that the DreamTime pairs a traditional inflatable pad with an open-cell memory foam upper, wrapped in a nylon/soft fleece shell—whereas the Exped is just your basic inflatable, with a brushed polyester top. In practice, the Exped's brushed polyester, while soft, doesn't feel nearly as cozy next-to-skin as the DreamTime's fleece. On the other hand, should you spill food or drink on either pad, the Exped will clean and dry effortlessly, while the DreamTime will require considerably more grief to clean. The Exped's simpler design, its more rugged, waterproof exterior, its lighter weight, and its compact storage make it very appealing as an expedition/base camp pad. On the other hand, what about comfort? To me, there's no comparison: the DreamTime is a more comfortable pad. The firmer DreamTime feels much more like a real mattress than the Exped, which has the squishy-soft feel of a typical inflatable pad. That said, some people will prefer the extra depth and softness of the Exped. For example, my wife, who is on the curvy side, finds the Exped more comfortable for side-sleeping because it better accommodates her hips. So if you've got hips like my wife, call me...er...I mean, you too may prefer to sleep on the Exped. My bottomline here is going to be that I pick the DreamTime for car camping, because of its better comfort. For use in the field, I say get the Exped (or a lighter pad!). The materials and construction are first-rate, the weight is acceptable, the warmth is incredible, the design is elegant and simple (and food-proof), and it rolls up easily and compactly when you're don't need it. Very nice!